We can provide high quality sound and lighting for your wedding. We can tailor packages to suit your wedding theme. 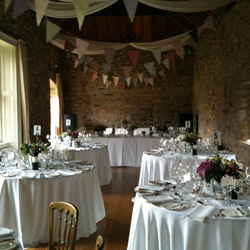 From PA hire for making wedding speeches and toasts to systems for DJ's and bands. We can provide systems with multiple sets of speakers for larger wedding venues to provide an even spread of sound for your guests. Some people hire systems to take center stage others prefer their wedding asthetics to have it hidden, let us know what you want to acheive and we will provide you with a suitable setup. If you are having a DJ at your wedding and want to ensure that you get the best sound quality possible you can choose from some of our most popular hire packages. With the popularity of having bands play live sets at weddings being at it's highest we have put together some packages to take the hassle out of arranging Live PA hire for your wedding. The most popular ones can be seen below. Below you will find a range of PA systems with microphones available for rent that are perfect for doing wedding speeches, available with both wireless microphones and also high quality table top microphones for the top table. We have a range of portable battery powered PA systems, perfect for use at weddings ceremonies that will be held outside with no access to power. The systems come with wireless microphones perfect for readings and also for the ceremony vows. We can hire staging in various sizes and heights to meet your requirements. If you are looking for a stage to use outdoors please contact us for further details. We can hire uplighting to give your event some colour both indoors and out. Please contact us for more details.